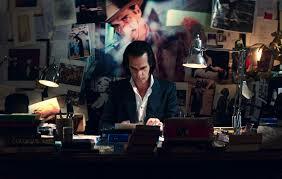 20,000 Days on Earth reflects the number of days in Nick Cave’s life so far and this engaging docu / rockumentary starring and narrated by Nick himself looks back over those days and delves into the heart of his creative processes, how he goes about writing songs and then delivering those through magnetic live performances. I’m a big fan of Nick Cave and have closely followed his musical journey since the implosion of The Birthday Party through to his 15th Bad Seeds album Push the Sky Away, the creation of which forms the primary musical backdrop to the film. I think there are very few artists who have managed to mature so gloriously from such riotous beginnings and none who can match Cave’s brilliant lyricism that can conjure up images of such love and tenderness mixed with downright menace and intensity. The film covers Cave’s fabulous career to date while charting his meanderings around Brighton (where he lives) for one day from dawn to nightfall interspersed with live recordings, either creating the album in France or taking it on the road triumphantly to the Sydney Opera House. Cave drives round Brighton in the drizzle going to a fictional therapy session (with Alain de Botton) and visiting key Bad Seed collaborator Warren Ellis for some eel stew whilst delivering him a pair of stuffed birds that he has in the back of the car. All the while he is chatting away and exploring his life and creativity and what that means. As he chats people from various points in his career appear in the car with him and join in the conversation before fading away as if figments of his imagination. Ray Winstone, Blixa Bargeld and Kylie all pop up in the car. Of course not all elements of his life are included but through this quite unusual vehicle there is enough for you to grasp what he is about, where he has come from and what drives him. Cave comes across as a highly intelligent, reflective, caring and funny man but above all someone in love with the concept of creativity through words and this comes across beautifully in many moments of the film, not least when he describes his love for his wife Susie and how she represents the distillation of all the beauty and fantasy that he can imagine. A genuinely touching moment. He talks of his writing process and how important it is to constantly write, to work on it, to have ideas, that each idea is a small flame and if you nurture it you never know how big the fire might grow, particularly when you hand your idea over to others and to see what happens through collaboration. He stresses the importance of having a go and to trying things as it’s far better to try and fail that not to try in the first place. I’ve been fortunate to see Nick Cave and the Bad Seeds on a few occasions and there are few people who can match his intensity on stage where for me he appears like some long limbed Gothic karate kicking preacher here to wrangle and writhe and conjure up some Faustian pact before your very eyes. This is captured in the final moments in the performance of Jubilee Street, which as it builds to a crescendo is mixed with flashes of Cave performing at all stages of his career before the film ends, at night on the seafront in Brighton with Cave musing on the flame of ideas. I’ve seen lots of films of bands I like over the years and most music documentaries are to be honest not that great. This is different in many ways and I was spellbound from start to finish. Whether or not you are a Nick Cave fan go and see this it’s brilliant.